Built for 4K, in gaming and content creation. 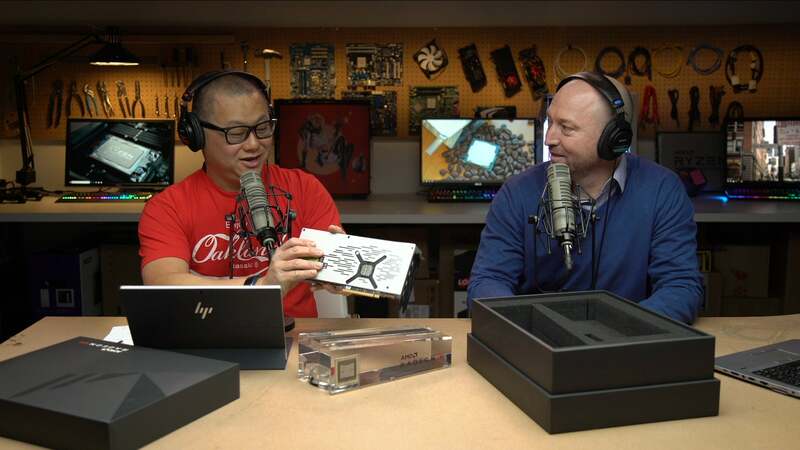 Should you buy the AMD Radeon VII? Radeon VII breaks new ground for AMD, and for graphics cards in general. It’s the company’s first truly high-end 4K GPU, capable of surpassing 60 frames per second at High or Ultra settings. It’s the first-ever consumer graphics card built using the next-gen 7nm manufacturing process, and the first to ship with a massive 16GB of ultra-fast high-bandwidth memory (HBM). 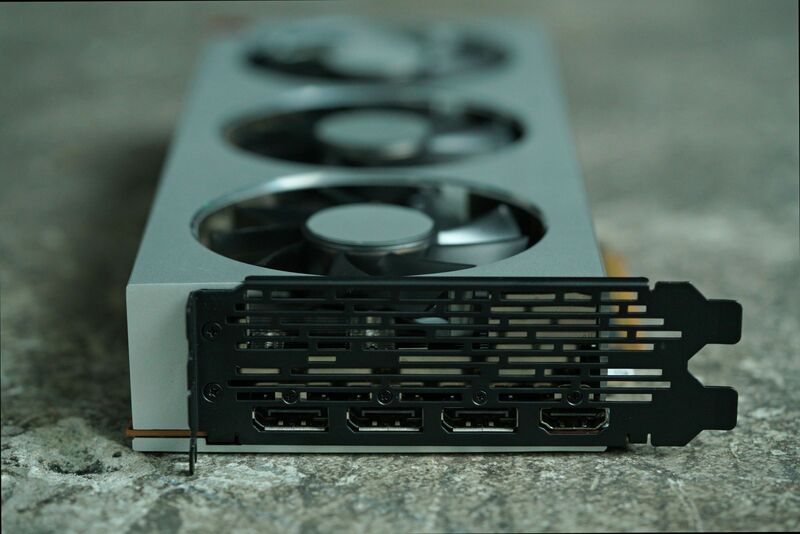 Radeon VII is even the first AMD graphics card that shifts away from reporting the GPU temperature alone to monitoring a more holistic array of 64 thermal sensors spread across the die. This is impressive hardware, the likes of which gamers haven’t seen before. It’s no GeForce killer, though. The $700 Radeon VII trades performance blows with the similarly priced Nvidia GeForce RTX 2080 and even the two-year-old GTX 1080 Ti. Nvidia’s recent embrace of adaptive sync monitors eliminates AMD’s FreeSync monitor pricing advantage. And AMD’s graphics card lacks the real-time ray tracing hardware offered by GeForce RTX GPUs, though very few games take advantage of those capabilities at this point. But don’t let those trade-offs deter you. Nvidia’s offerings have plenty of their own limitations, and AMD’s Radeon VII is a very competitive bleeding-edge beast of a graphics card. Let’s dig into why. AMD also optimized the second-generation Vega architecture to provide lower latency, as well as more bandwidth to the render output units (ROPS). Those tweaks help improve gaming performance, while “increased floating point and integer accumulators” help boost results in compute workloads, a big focus for AMD with Radeon VII. AMD also tweaked temperature monitoring significantly in Radeon VII. Traditionally, AMD graphics cards reported and adjusted performance based on a GPU temperature taken from a single sensor near a thermal diode. 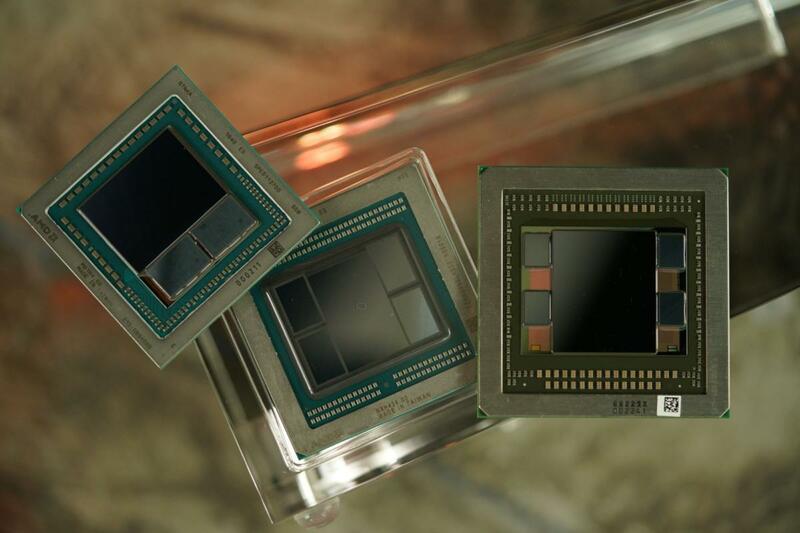 Modern GPUs, by contrast, come laden with temperature sensors: Radeon VII contains a whopping 64 spread across the chip—twice the number on the Vega 64. AMD’s graphics card takes advantage of all that hardware with a new “Junction Temperature” reading that handles thermal throttling and fan control using all the available data. AMD claims the switch offers more dependable throttling behavior and slightly increased performance in thermally limited scenarios, like many (but not all) gaming workloads. You can have your cake and eat it too, though, as Radeon Software’s Wattman overclocking tool reports both the new Junction Temperature as well as the standard GPU temperature. AMD’s Vega 64 chip vs Radeon VII. The shift from a 14nm to 7nm manufacturing process didn’t just improve GPU performance. 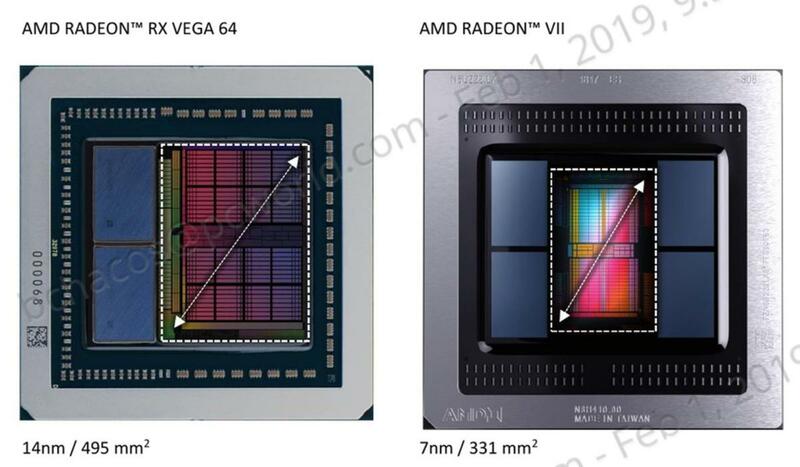 AMD managed to shrink the GPU die from 495 square millimeters in Vega 64 to 331 in Radeon VII. As a result, the company crammed two more 4GB stacks of HBM memory onto the chip, bringing the total number of stacks up to four and the total memory capacity to 16GB. That’s twice as much as you’ll find in Nvidia’s RTX 2080, and even 5GB more than you’ll find in the lofty $1,200 GeForce RTX 2080 Ti. Left to right: The HBM-equipped chips found in Vega 64, Radeon VII, and the Fury X. 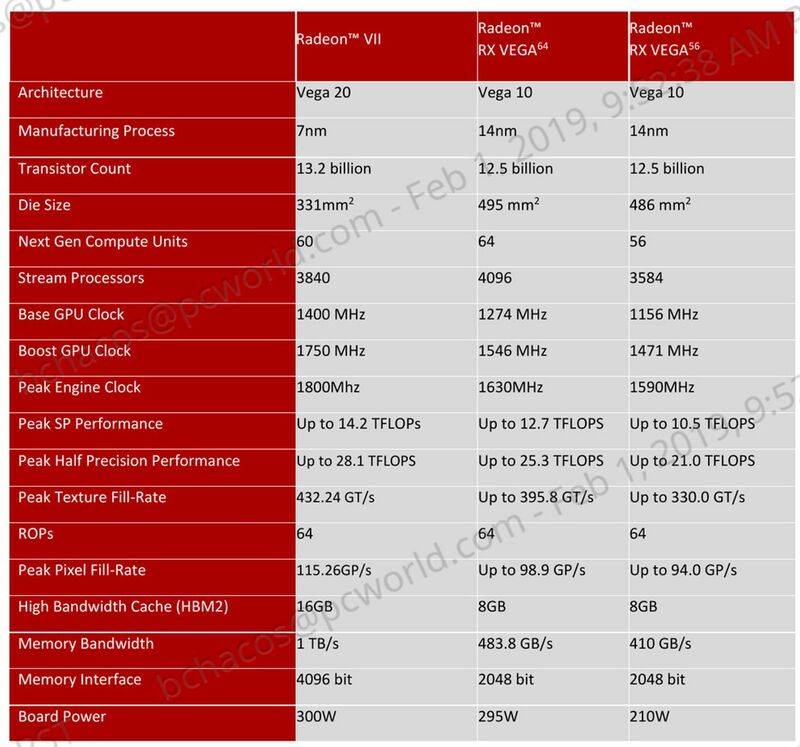 Just as impressive: Radeon VII features a 4,096-bit memory interface, compared to Vega 64’s 2,048-bit interface, giving the card as astonishing overall memory bandwidth of 1 terabyte per second. Sweet holy moly. By comparison, Vega 64 offers 484GBps of memory bandwidth; the GeForce RTX 2080 offers 448GBps; and the RTX 2080 Ti offers 616GBps. Such lofty memory capabilities offer benefits to gamers and content creators alike. Radeon VII shines brightest as a 4K gaming GPU, and games that offer 4K textures will often gobble up all the memory you can throw at it. A 16GB frame buffer offers abundant future-proofing if memory demands continue to expand, and it could also prove advantageous today if a 4K game exceeds the 8GB buffer offered by the RTX 2080. When a game surpasses the onboard memory total of your video card, it needs to tap into your much slower overall system memory instead, which can result in stutter-inducing frame time lag. For content creators, editing 4K or 8K videos can monopolize tremendous amounts of memory. Radeon VII can handle those workloads without breaking a sweat. Radeon VII also comes loaded with connectivity options, in the form of an HDMI port and three DisplayPorts. It lacks the VirtualLink USB-C connector that debuted in Nvidia’s RTX 20-series GPUs, but virtual reality headsets that support the newly created standard don’t exist yet, anyway. The card requires a pair of 8-pin power connectors to supply the 300 watts of energy needed to fuel it—a mere 5W increase over the Vega 64, despite Radeon VII’s significant performance uptick. The card itself looks absolutely stunning from top to bottom, returning to the stark brushed aluminum design introduced in the woefully rare Radeon RX Vega 64 Limited Edition. 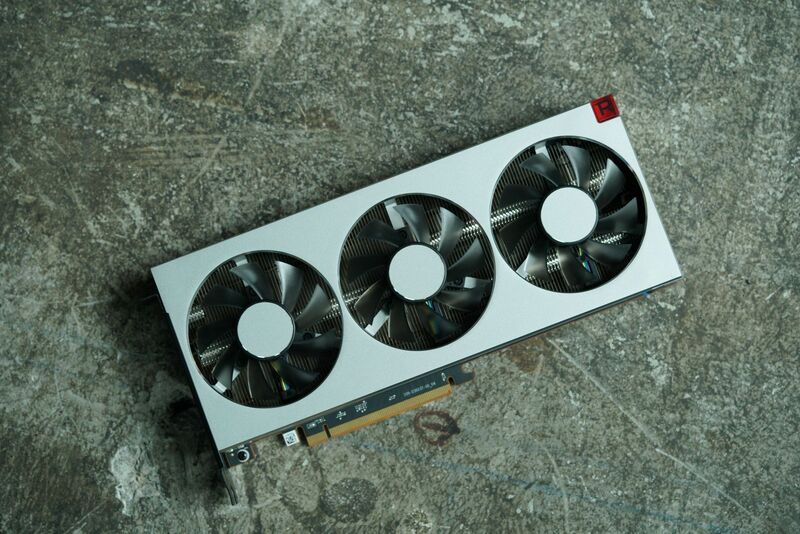 One key difference: While the Vega 64 Limited Edition included a single blower-style fan on its shroud that helped expel air out of the back of your PC, the Radeon VII follows in the footsteps of Nvidia’s GeForce RTX Founders Edition cards by switching to a more traditional multi-fan setup that pushes the heat dissipated by your GPU into your case instead. Three black fans adorn the shroud to assist in the endeavor. 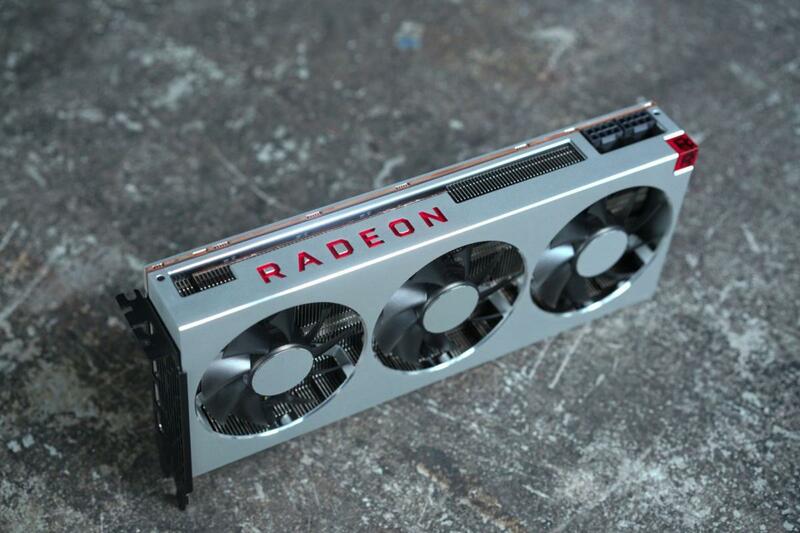 A red cube with a “Radeon” R lights up the outer corner of the graphics card when it’s running, an aesthetic matched by an illuminated red Radeon logo on the edge of the card. You can’t change the color of the LEDs. Normally, that’s not a big deal, but custom third-party Radeon VII graphics cards aren’t expected to be available when the card launches on February 7, so RGB fiends probably won’t be able to get their fix in the near-term. As a modern Radeon graphics card, Radeon VII also supports FreeSync 2 HDR, virtual super resolution, the Radeon Overlay, per-game overclocking, and all the other nifty features baked into AMD’s superb Radeon Software Adrenalin 2019 edition. For a limited time, AMD will also toss in three free games—The Division 2, Devil May Cry 5, and Resident Evil 2—when you buy the Radeon VII. But enough about the technical details. On to the games! AMD's Radeon VII is a fast, memory-rich graphics card loaded down with the latest technologies. It trades blows with Nvidia's GeForce RTX 2080 in 4K gaming.